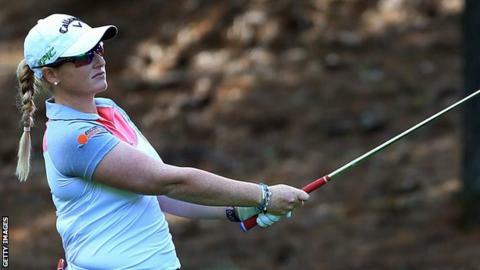 England's Holly Clyburn dropped to three shots off the lead after two rounds of the Canadian Pacific Women's Open in Ottawa. Clyburn, who started the day one off the pace, shot a one-under-par 70 to join six other players on five under. South Korea's In Gee Chun, runner-up four times on the LPGA Tour this year, carded a 67 to lead on eight under. First-round leader Marina Alex is two shots adrift with fellow Americans Mo Martin and Brittany Lincicome. England's Charley Hull is among a group of 15 players on one under, however compatriots Jodie Ewart Shadoff, Melissa Reid and Laura Davies all missed the one over cut mark by one shot. Clyburn, who missed the cut at her past three events, knocked in three birdies in her opening nine holes but gave two shots back on the closing nine. "I found it tricky on the back side," she said. "I played awesome from start to finish, just didn't get anything going in the hole from the backside really. "Other than that, I'm quite happy where I'm standing right now."